Make a thick batter using gram flour, rice flour, salt ,chilli powder & garlic flavoured water. To make the water crush some peeled garlic & mix it with some warm water & allow it to infuse. Strain the garlic after sometime & use the water. Slice the vegetables & keep it separate. Heat enough oil in a pan to deep fry & wait till it reaches temperature. 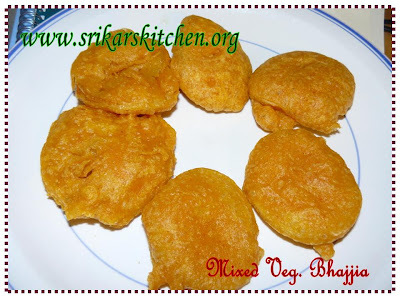 Dip the vegetables in the batter & deep fry until crisp & golden brown & serve hot with chutneys. Green plantain is very famous in south india & is a fast moving evening snack.rest all we can make it the way we wanted by adding the vegetables chopped or diced & that is called 'Kadamba Bhajji'. more to say i havent put chillies & green plantain in my picture due to unavailability. i feel like piking one of those and munching on along with tea! wow.. so yummy.. paaka supera irku. That looks yummy..want to have those with ketchup..
yummmmmmmmmmmmmmmmmmmy, with tea wud be wonderful :). Lovely n crispy bhajjis, garlic water is quite new for me...sema cuteaa iruku Sri..pasikuthu pa..
Ooh they look good! Can I ask what are 'Special' chillies? Wow perfect for the weather here. For me bhajjis are betterhalf of evening tea or coffee. Mixed vegetable is nice idea. Wanted to eat right now from the plate.....Looks very very delicious..
Garlic flavoured water is a nice touch.. how do you make that? That looks perfect.. Nice snack for a snowy afternoon. I have something for u in my blog..
Plantain bhajjis, its been years since i made those, tempting. Nice and Crisp,Please pass it over,its going to be tea time soon. thankx for the comment. well special chillies are long light green in colour & especially for this dish only. it is not spicy as the name mentions but uc an get it in indian markets in east ham, east london.